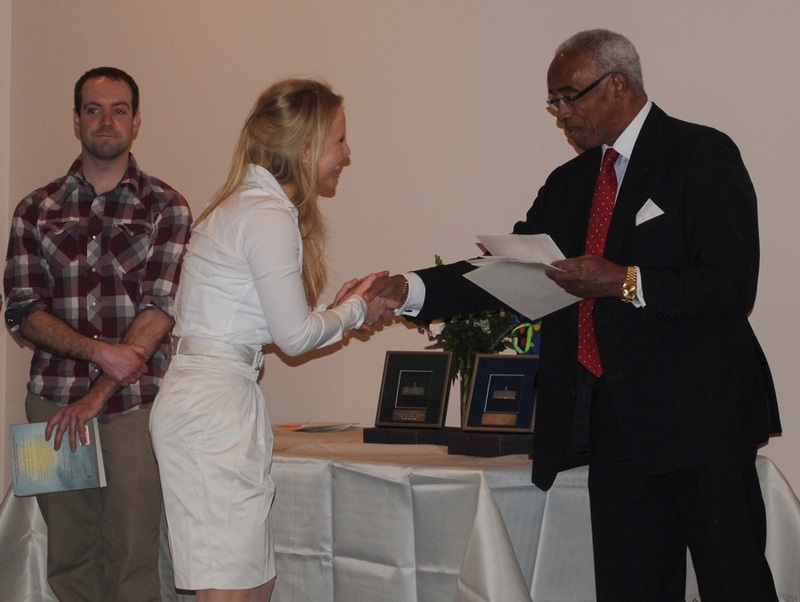 This award was established in 2010 to recognize excellence within residents who demonstrate commitment to global health as they advocate for marginalized populations and explore new ways to engage in clinical service, education and research in underserviced populations in Canada and abroad. Dr. Murray is a world-renowned expert in multiple sclerosis, medical humanities and medical history. Dr. Murray is a former Dean of Dalhousie Medical School; Professor Emeritus at Dalhousie University and remains active in the Medical Humanities Program. He is an Officer of the Order of Canada and member of the Order of Nova Scotia. Dr Murray is a strong advocate for the values within global health. Dr. MacDougall is a Fellow with Global Psychiatry and First Episode Psychosis in the Psychiatry Department, Dalhousie University. Dr. MacDougall is described as a “Global Physician” who advocates for system change in mental health in marginalized communities locally and globally. During her fellowship she helped develop a collaborative partnership between the Stanton Territorial Health Authority in the NWT and Dalhousie University. The focus of this partnership is to strengthen resident opportunities available in the NWT through clinical care delivery, education, capacity building and research. Dr. MacDougall has also been involved with developing training materials for the, well established, Global Psychiatry partnership with Guyana and has worked with First Nations communities in Canada. Upon completion of her fellowship Dr. MacDougall plans to continue her career in Global Health focusing on capacity building and mental health service research in under resourced communities locally and abroad. 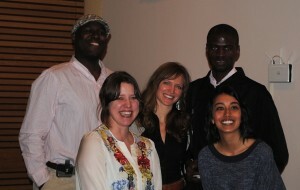 Check back early May when we will announce the Dr. John Savage Memorial Award for Faculty Leadership in Global Health. 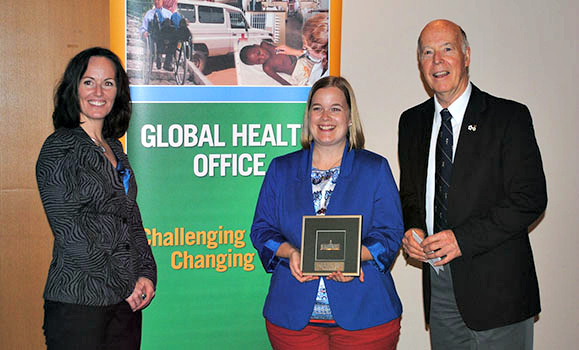 The Global Health Office is pleased to present the Dr. Ron Stewart Award for Student Leadership in Global Health to Danielle MacDonald (Nursing). This award was established in 2006 and is given to a student who has demonstrated leadership in global health and a committment to improving the health of marginalized communities during their time at Dalhousie. This award honours Dr. Stewart’s personal, professional and educational support and dedication to global health and the advancement of social capital worldwide. 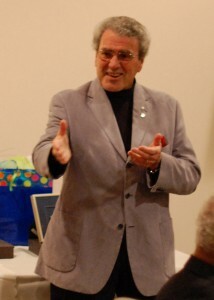 Dr. Stewart, a former provincial Minister of Health and Order of Canada recipient, has been enriching students’ experiences at the Dalhousie Medical School for many years as a popular and accomplished educator, past Director of the Medical Humanities program and as a key champion for global health education. Danielle’s committment to global health has been evident throughout the completion of her nursing degree. Perhaps her biggest achievement has been as founder of the School of Nursing Global Health Committee and solidifying its place in the Dalhousie University Nursing Society constitution. 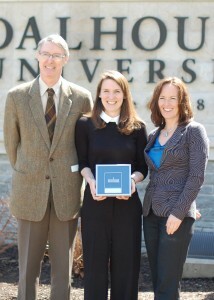 Danielle consistently demonstrates a committment to sustainable partnerships in Nova Scotia and Tanzania, where she has focused most of her global health initiatives on research and education. 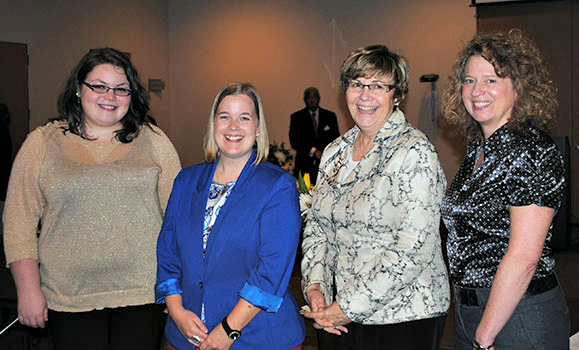 Danielle celebrates her award with Nursing colleagues (from L-R) Katie VanPatter, Dr. Kathleen MacMillan (Director) and Dr. Megan Aston. 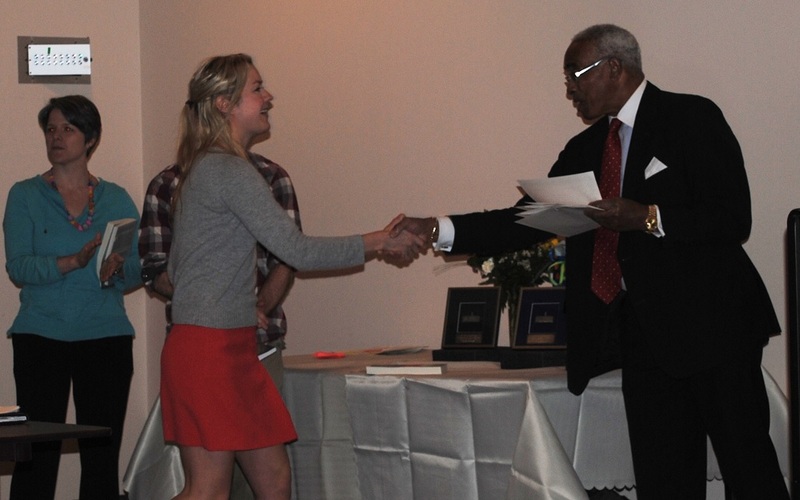 As part of her summer experience in Tanzania in 2012, she helped in the orientation and guidance of medical, nursing and pharmacy students who were first time participants in the summer program. She was able to support these students as they “got their feet underneath them” in Tanzania. She also met with the Dean of Nursing at Muhimbili University and was pivotal in re-establishing Dalhousie’s relationship with their Nursing Faculty. She was able to write grants, coordinate a nursing faculty team and gather support to realize the first official visit of the Dalhousie School of Nursing to Muhimbili since the 1990’s. Danielle is a natural leader who supports and encourages others to pursue involvment in global health. Danielle is also a graduate of the Advocates in Global Health Program. Next up we will announce the winner of the Dr. Jock Murray Award for Resident Leadership in Global Health. 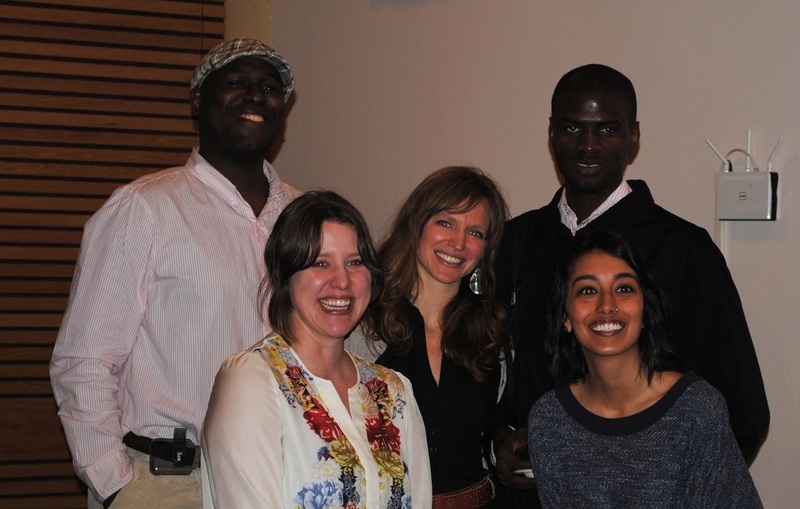 The Advocates in Global Health program is a two-year extracurricular program for students in the Faculties of Medicine, Health Professions, and Dentistry, officially launched in early 2012. The program was developed in response to growing student interest in Global Health, and to fill a gap in global health education at the university. Participants build knowledge and skills in two intersecting areas: Advocacy, which is a recognized competency across the different health professions, and Global Health which is concerned with the bigger picture of health – the social, political, economic, and environmental factors that influence health and healthy equity – both locally and internationally. In order to achieve these objectives, we’ve engaged faculty from various disciplines to support the program, and foster interdisciplinary learning. Students come together in an inter-professional environment to deepen their skills and knowledge via program modules in three streams – Knowledge, Professional Development, and Public Engagement. If any of you are interested in more information about the program, please contact the Global Health Office. In part I of this series, we identified health advocacy as an overwhelming topic, yet a role that is expected of healthcare professionals. In part II, we aim to provide a working definition of advocacy as well as provide examples of how advocacy may be incorporated into professional practice. 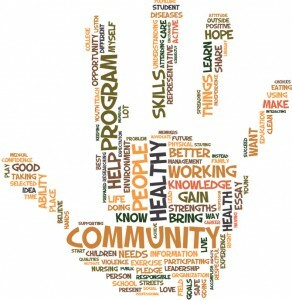 Advocacy can be achieved at many levels, including the individual, the community, and/or the population. Individual patients need physicians to assist them in navigating the healthcare system and accessing the appropriate health resources in a timely manner. This includes things like phone calls to specialists to speed up referrals, helping a patient find a family physician, and advocating for improved access to treatment for patients in rural areas. Communities need physicians to identify and address local health issues and determinants of health in the community in which the physician practices. This includes things like encouraging safer and healthier environments, promoting recruitment and establishment of necessary specialists and health services, and working with community outreach programs. Populations need physicians to identify and address health needs and determinants of health of marginalized, disadvantaged, and vulnerable populations on a local, provincial, and national scale. This includes things like promoting aboriginal and refugee health equity, supporting mental health initiatives and destigmatizing mental illness, and promoting public health. Often, this type of advocacy occurs at a political level to promote changes in policy and practice. Following Angela’s informative introduction were presentations from Dr. Scott, Dr. van Zoost, and Dr. Hennen about what advocacy means to them and the experiences they’ve had as health advocates. Most striking was the passion each of these physicians holds for the work they do. Whether it’s encouraging the development of midwifery (Dr. Scott), starting a health promotion and foot care program for the homeless (Dr. van Zoost), or advocating for people with disabilities (Dr. Hennen), each physician personifies a burning, unequivocal devotion to their patients and their communities. And the surprising part? Few considered themselves advocates until invitations to this workshop highlighted that they were, in fact, actively engaged in advocacy. They got involved in their respective advocacy efforts because they felt it was right and because, as physicians, they were in the privileged position to do so. Their enthusiasm for advocacy continued to be apparent in the second half of the workshop when participants broke in to small groups and, with the help of the presenters, worked through practice scenarios that stimulated discussion around social determinants of health and potential courses of advocacy. Groups identified personal, social, cultural, and environmental factors that contribute to the health (or lack thereof) of individuals, communities, and populations. Barriers to the access and availability of health services were recognized and possible solutions discussed. And through it all, the presenters facilitated the discussion in a way that made health advocacy much more than an ambiguously defined, yet nationally directed, part of medical practice. They showed health advocacy to be an inspiring and fulfilling characteristic intrinsic to the role of physician. So maybe it’s not only about satisfying the criteria of a competency framework, but engaging with your patients and your community. Not only about reciting definitions, but understanding and acting on social conditions, situations, issues, and policies that incense the moral fibres that lead us to become doctors in the first place. Not only about fulfilling professional obligations, but promoting social justice and human rights. © 2019 Global Health Office | Challenging Minds. Changing Lives.